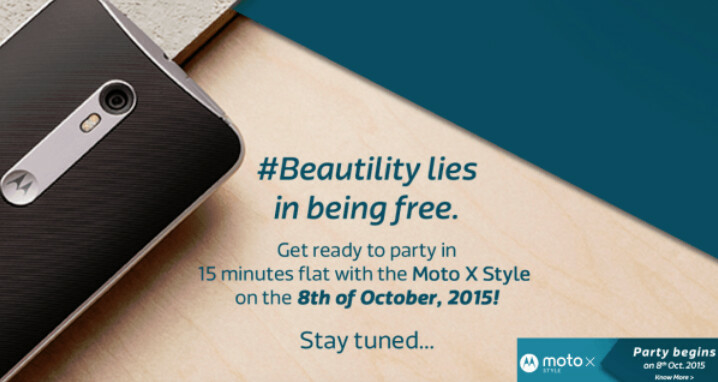 Indian online retailer Flipkart has posted a teaser that reveals the launch date for the Motorola Moto X Style in the country. On October 8th, the device will be available in India as a Flipkart exclusive. The third-generation Motorola Moto X Play and the third-generation Motorola Moto G have both been already launched in the country. The Moto X Style comes with a 5.7-inch display, carrying a resolution of 1440 x 2560. That works out to a pixel density of 515ppi. The Snapdragon 808 SoC drives the handset, carrying a hexa-core 1.8GHz CPU and the Adreno 418 GPU. 3GB of RAM is inside with 16/32/64GB of native storage. Those seeking more memory can access the 128GB capacity microSD slot. Found on the back of the handset is a 21MP camera, with an aperture of f/2.0. The front-facing selfie snapping shooter weighs in at 5MP, and includes a wide angle lens. A 3000mAh battery keeps the generator humming, and the included turbo charger will give you 10 hours of life with just a 15 minute charge. The nanocoating used by Motorola will protect the phone from spills and light rain. Android 5.1 is pre-installed. The Moto X Style supports 4G LTE, 3G, Wi-Fi, Bluetooth 4.0, GPS, GLONASS and NFC connectivity. Motorola will be facing some tough competition in the high-end niche of the Indian smartphone market. The Apple iPhone 6s and Apple iPhone 6s Plus are expected to arrive in India on October 11th. Two days after that, Flipkart will offer the Nexus 6P, starting at the equivalent of $614. While pricing for the Moto X Style is unknown for the moment, the device had previously been imported into the country valued at approximately $466 USD. I am hoping for INR 25,000, given moto g and moto x play prices. On your face Nexus 6P.The pricing is going to be great. iPhone is no competition to anyone in India. India is all about value for price. If the pricing is right.Its the great phone to buy as huawei nexus 6p is around 40k on launching. motorola screwed moto x with screen size. such a big phone :( all because bloody phablet trend.